Malach couldn’t believe that the gods would grant him a second chance, but they had when he rescued Sascha from the hands of a pack aligned with hellhounds. Now, Malach will do everything to help and heal his Delta, even if it means making the greatest sacrifice of all. 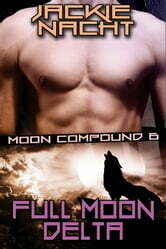 Being a Delta and abused all his life, Sascha has little trust in shifters. Now living in Moon Compound and with a mate, he must first learn to trust and then tell his mate they can never be together. For to be with a Delta is to be with the dammed. Roses are Red and Thorny...Ouch!